I’ve been thinking a lot lately about the amount of junk food I have consumed in my 23 years of living and I wonder, can I possibly stay away from it all together? Am I mentally strong enough to say no to junk food and sweets? Well as challenging as it sounds, I like to believe that I am capable of doing so. I mean, I’ve already cut out fast food and sodas, which I didn’t think would be possible either but it’s been almost two years now. I admit that I will occasionally indulge in a Sprite just to quench my thirst for something fizzy but for the most part I have replaced sodas with sparkling waters, which give the same fizzy effect. It’s all about finding a healthier alternative! Aside from In N Out (my weakness), I have only had fast food a few times in the past couple of years and each time resulted in an upset tummy for me. It’s amazing how intricate our bodies are. If we just start to pay attention to what our bodies are telling us, we will begin to learn just what it is that we need. This is another thing that I learned from reading The Body Book and I have just begun reading another fabulous book called, Go With Your Gut that also emphasizes the importance of listening to your body. Already, within the first few pages the author, Robyn Youkilis mentions how important it is to take a deep breath and listen to what your body wants before you start to eat. Are you really hungry? How much should you make? Etc. Do you ever get a stomach ache or heart burn or any feeling of discomfort and think, what did I eat? This is always the first thought that comes to my mind, as it should be. What we put in our stomachs can have so many different effects on our bodies whether it’s just a little discomfort or something as serious as diabetes or heart disease. You’d think that we would all know better than to shove our faces full of unhealthily foods but for some reason it can seem impossible at times. I used to have a serious weakness for hot Cheetos. I mean, I sort of still do but I told myself that the last time I had them would be the last time ever. As I have adopted a somewhat healthier eating style, my body has begun to react differently to those bad foods that I had previously eaten much more commonly. If I eat hot Cheetos now, I majorly regret it the next day when my tummy is in so much pain that I wish I could travel back in time and decide against the dang bag of Cheetos altogether. I recently shared a viral video on my Facebook page showing different types of kids snacks that are linked to serious illnesses and even cancer. Yes CANCER. I hate the word, but I feel that it needs to be emphasized here. These are snacks that I have eaten since I was a kid and they continue to be placed in children’s lunch boxes to this day! Someone needs to do something to stop it. We all need to be educated on what types of foods absolutely do not belong in lunch boxes and more importantly our own bodies! It irks me to think that huge corporations are banking on selling us these foods that are ultimately making us terminally ill. And we are falling for it, in fact we don’t even care. We don’t think far enough into the future and what our health will be like in a few years to even be bothered by what we are consuming today. It can be compared to smoking. A person may start smoking as a teenager because it’s cool or makes them feel good in that moment, but we know now that smoking can have many unfortunate health effects in the long run. It effects your skin, teeth, lungs and can ultimately cause cancer. So why don’t people just stop? Well because it’s ADDICTING and the effects are not immediate so people don’t realize (or care about) how much damage they are doing to their bodies until it’s 30 years down the road and they’re being diagnosed with lung cancer. In a very similar way, junk food, sweets and sodas can become ADDICTING. It’s not natural and it’s not right. I always try to think about what people ate before all of these tempting snacks and sodas existed. Back when humans were hunter-gatherers and there was no Diet Coke or fast food. They had only what the earth provided for them, vegetables, fruits and occasionally some protein from an animal. And to drink- WATER, the ONE DRINK that God filled this earth with, the only drink that we NEED. It can be used to make tea or coffee, but it is a human necessity without which we could not survive. To think that at one point in my life, I probably went days at a time without drinking water, replacing it with sodas- it makes me so sad. But also happy that I have since learned and no longer fall prey to the soft drink and fast food industries. So Back to Basics is what I have decided to title this post because- in life that is all we need. The Basics. Food from the soil of the earth, fresh water, a place to live and people to love. It can be hard to remember, I personally struggle all the time with wanting more stuff. I think “I have got to have this or I NEED that” to the point where I feel almost stressed out about not having it. I catch myself feeling this way and force myself to take a deep breath and say a little prayer to make that feeling go away. I know that I shouldn’t be so worried about material things but it is something that I always have a hard time with and I assume I will continue to but I will try my best not to. And that’s all we can do- TRY. It’s the same with food. I’ll see a picture of a delicious dessert on the menu at some restaurant and think “I need that”. Then I will order it and feel so full afterwards that I’m just uncomfortable. It would be like if I were to go shopping for clothes and think “I need all of this!”, I would go home feeling guilty about spending so much money. Sure it’s satisfactory in that moment, like the taste of a chocolate fudge brownie or the feeling of getting a bunch of new clothes to wear, but eventually that feeling fades. It’s only temporary. WE are only temporary. Our lives on earth are not forever. We all know this, and most of us hope to live out long lives rather than having them suddenly cut short. So we must be constantly conscious of the fact that these lives are temporary and if we want to get the most out of them then we need to do everything we can to make these bodies last. Your body is the vessel that carries you throughout your lifespan. GIVE IT WHAT IT NEEDS. Love yourself, drink water, be active, stay away from toxic treats and slowly but surely clean up your eating habits. You will look and feel so much better. So please feel free join me on this journey of cutting junk food out of my life for good and learning new ways to stay healthy. I’ll post as many healthy recipes as I can and I will do my best to keep you motivated all while trying to motivate myself! 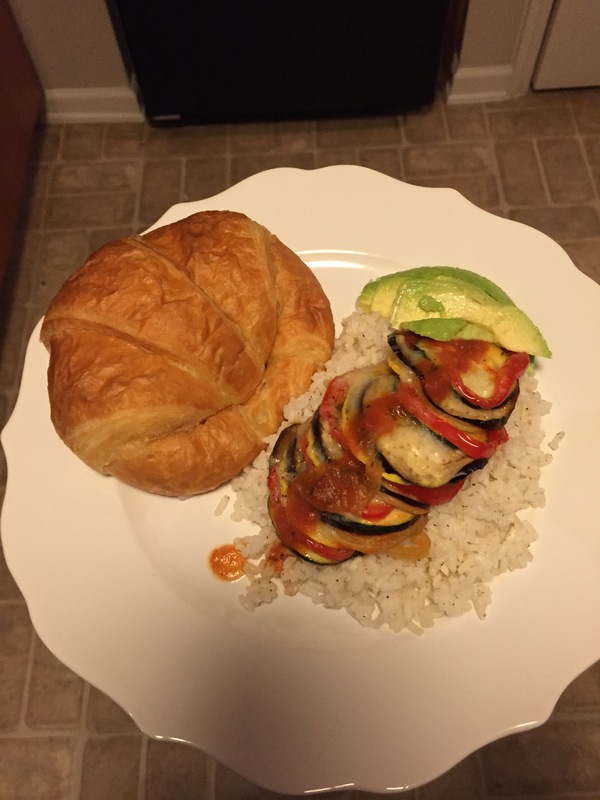 In high school I took a cooking class and one day we learned to make Ratatouille, it was just after the Disney movie had come out so I was pretty stoked. We made a different version from the one in the movie, it was not as pretty but still delicious. 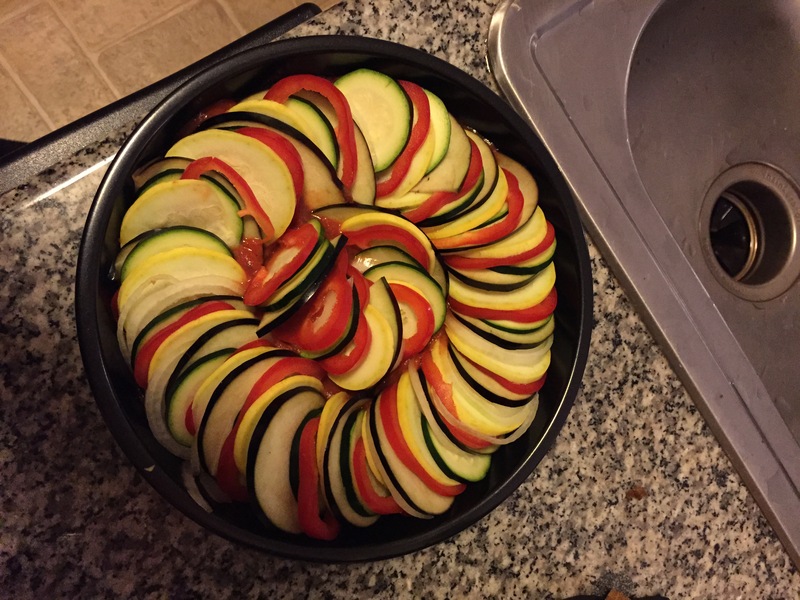 As I was searching Pinterest for healthy recipe ideas I saw one for Ratatouille and I had to make it! This time I was going to attempt to make it just like the one in the cartoon. Since we do not care for tomatoes, I changed the recipe to include red bell peppers instead and pasta sauce rather than tomato paste. The funny thing is that I went to Sam’s Club over the weekend before I had even decided to make Ratatouille and got croissants and macaroons…. I guess I was unknowingly channeling my inner French Girl. Anyway, here’s what you’ll need!! I started by cutting the veggies into VERY thin slices. It’s important that the veggies are all similar in size if you want the dish to look the way it’s supposed to. 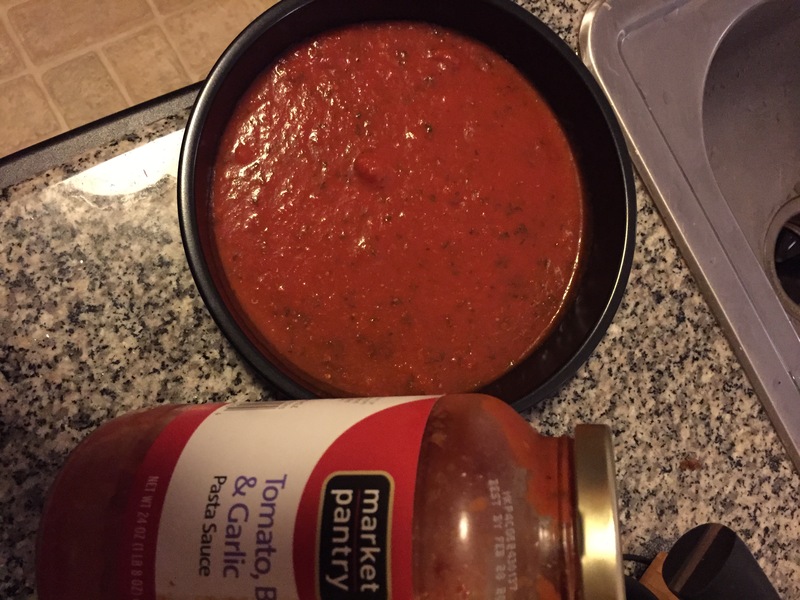 I used an 8″ Non-stick round baking pan and poured a thin layer of the pasta sauce along the bottom (just enough to cover the whole thing). 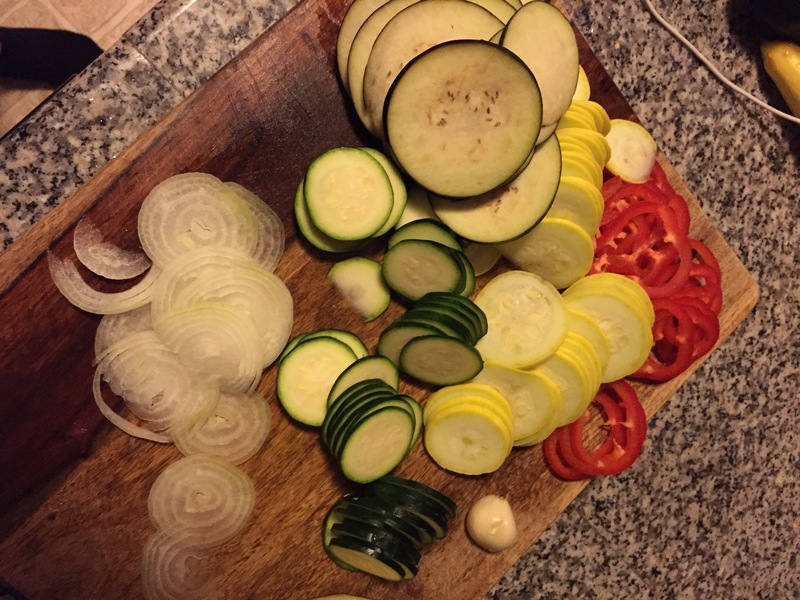 Once you’ve cut all of the veggies start layering them along the pan and make sure you keep the color pattern the same the whole way through if you are trying to make it look good. After you have the veggies all lined up and beautiful, drizzle the 2 tablespoons of olive oil over the top. Season with garlic salt, pepper and thyme. Place in the oven for 20 minutes, and while the Ratatouille is cooking, start cooking the rice as well. If you’ like to add the cheese, remove the dish from the oven at 20 minutes, sprinkle with mozzarella and throw it back in for about 10 minutes. I served the Ratatouille on top of a bed of white rice and topped it off with some of the excess pasta sauce from the bottom of the pan. I also heated up a couple of croissants and served them on the side, then we had Macaroons for dessert! It was unintentional, but having a French themed meal was lot’s of fun and really delicious! Bon Appetit!